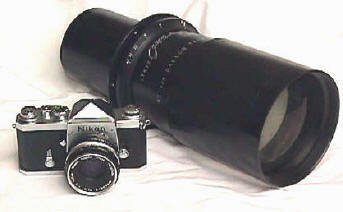 Any large format 1000mm lens is rare, much less a relatively fast 1000. 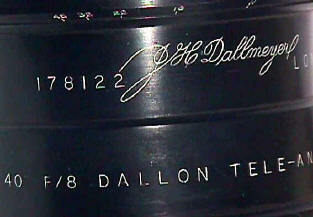 40" /8 JGC Dallmeyer of London Dallon Tele-Anastigmat, Coated, f/stop down to f/45. Filter size an economical 133mm or 5 1/4". Barrel mount. Not sure what this was made for, but I don't think it was Minox. It weighs in at a lightweight 15 lbs. Rear Flange 4 1/4". Not sure what this covers, but I would imagine at least 4x5 and probably 8x10. More info on the lens would be appreciated. Add some tubing and a bellow at the rear for focusing, and you have a 1000 for everything from 35mm to 4x5 -- or maybe larger. Hmm. Maybe not a Minox, but it would look great on a Pentax 110 Super!! Revised: November 25, 2003 . Copyright © 1998-2002 Stephen Gandy. All rights reserved. This means you may NOT copy and re-use the text or the pictures in ANY other internet or printed publication of ANY kind. Information in this document is subject to change without notice. Other products and companies referred to herein are trademarks or registered trademarks of their respective companies or mark holders.